“Boooooring” with an eye roll might be the reaction you get from your teen at any mention of a museum. But for social media-loving teens, these museums are anything but boring. Your teens (and you) will be taking pictures at every corner in these colorful, funky museums across the U.S.
A guided tour through this graveyard of neon signs will surely have the kids clicking, snapping and posting away. The nearly two-acre outdoor and indoor exhibit features more than 200 signs that once pointed folks in the right direction to hotels, motels, shops and restaurants. A self-guided tour of nine restored signs is also open to the public. Make sure to plan ahead — the guided tour tickets are available for purchase a month in advance. Bright colors, a popsicle wall, swings, a pool of sprinkles and ice cream… need we say more? Instagrammers are hot for this pop-up museum, currently in San Francisco. When it’s time to rock, you bring the kids to the epicenter of music. The Rock and Roll Hall of Fame celebrates all sound. From Blues and R&B to Bandstand, the Beatles and Beyonce, all music is honored here. Kids will love learning about the history of music, getting to know the inductees, seeing the instruments and hearing the sounds that fill this museum, which is worthy of Instagram. Located along the beautiful coastline of the Delaware beaches, this small, hidden gem of a museum is packed with treasures you kids will want to share on social media. 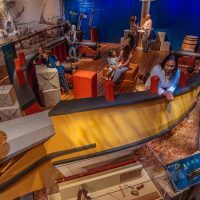 Gold bars, coins, weapons, jewelry, fine china and other artifacts from the Titanic and hundreds of other artifacts from shipwrecks dating back as far as 1622 can be found at DiscoverSea Shipwreck Museum. All of the treasures are from museum owner Dale Clifton’s personal collection. If you’re lucky enough to visit when Clifton is working in the shop, you will hear fascinating stories of treasure hunts and shipwrecks. Visitors even get the opportunity to hold a gold bar or exquisite jewelry found in the sea, so be ready for selfies! Kids will love checking out all the spy gadgets and gizmos like the briefcase camera, escape boots and flashlight gun, at the International Spy Museum in Washington, D.C. The hands-on exhibits, such as how to crack a safe or conduct a lie detector test, will also please teens. Make sure to swing by the Bond Car, an Aston Martin DB5, too! There are some restrictions on photography (spies do need to keep some things secret), but there is plenty to share on social media at this unique museum. This Canadian museum celebrates humanity and will show teens appreciation, humility and respect. The modern and architectural marvel of a museum celebrates human rights, inclusion, hope and possibilities. Difficult topics are exhibited at the Canadian Museum of Human Rights but the art exhibits, sculptures, personal stories and interactive screens show how far human rights have come and how far they could go in the future. Kids will also love to see exhibits of their peers who have inspired change as children and perhaps your child will be inspired, as well. National Baseball Hall of Fame Museum in Cooperstown, N.Y.
For baseball fans, this is the ultimate share on social media. 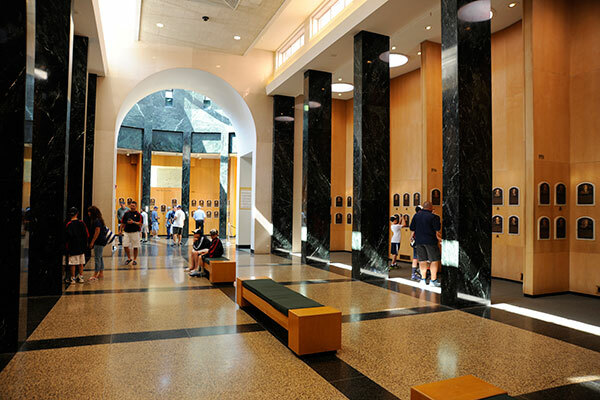 The National Baseball Hall of Fame Museum features three floors of baseball artifacts and fun. There are historic images, videos, hall of famers and hands-on exhibits to marvel at while in Cooperstown. The self-guided tour allows fans to spend as much time as needed to explore, while also composing the perfect selfie. Free Wi-Fi is available inside the museum and all photography and videography is encouraged. Don’t forget to tag @baseballhall!